In the town of Herning in Central Denmark, in the largest exhibition centre in Scandinavia, on the week of the 13th November 2018, we were delighted to exhibit alongside Weber Denmark at FoodTech 2018. Announcing our partnership with Weber was wholly successful, and having our booths next to each other at the show allowed us to showcase our complete line solution at the end of a Weber slicing and packaging line. Attendees were very impressed by our robust design, small footprint and combination of the relevant technologies on display and were particularly pleased by our paperless audit functions. FoodTech was also the location for the 2018 IFC World Congress and this year’s theme was wastewater in the food industry. It was inspiring to listen to the speakers discussing the future of water usage in the food industry and both the current and future technologies allowing food producers to reuse water, and it was amazing to see so much concern and awareness around the topic. 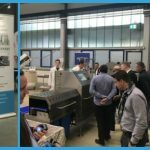 It was also our opportunity to showcase our Cerberus All-in-One metal detection, packaging inspection and checkweigh system, which also went down extremely well with the guests. And moving into 2019, we are very excited for the successful cooperation with Ole Balzer and his team at Weber in Denmark. Unfortunately, the next FoodTech conference isn’t being held until 2020, but if you ask if we’ll be attending the next one, the answer will be a strongly resounding “yes, of course”.